Effective leaders are nice people. Let’s admit it, no one wants to finish last. 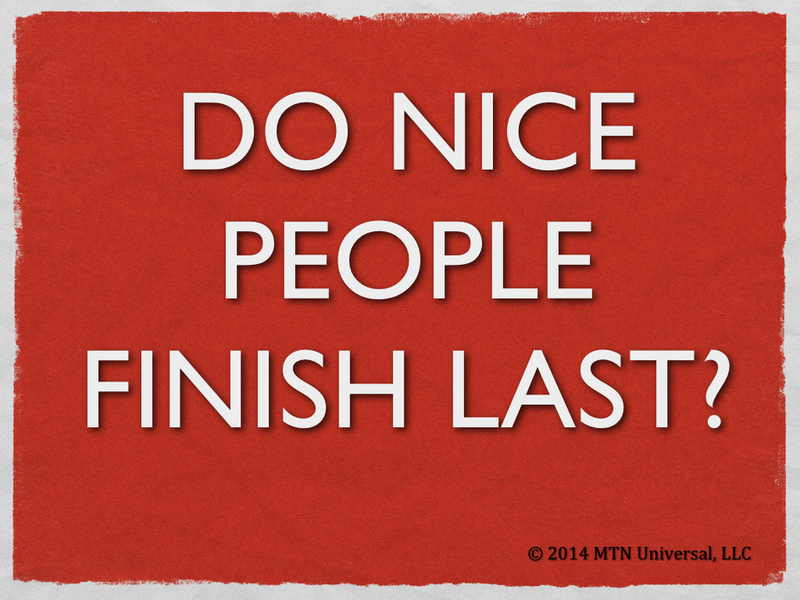 But, do nice people finish last? There are many ways to define the word “nice.” If I asked a hundred people to define what a nice person looks like, I could receive a hundred different answers. Nice is basically a pleasant, delightful, or agreeable person. Why Do Nice People Finish Last? Many times, it seems as if good people finish last because the nice person will usually attempt to do the right thing. Doing the right thing can sometimes be mistaken for weakness. For example, the pleasant, delightful, or agreeable person will act with integrity, sympathy, compassion, warmth, kindness, and a cooperative spirit. You would think these traits would be a positive, but in some instances it can be viewed as a negative. There are some who believe a good leader is a tough and more disagreeable person. Nothing could be further from the truth if a person has that perspective. Why Nice People Finish First? I believe the traits and qualities mentioned above makes for an exceptional leader. The greatest example of a leader is Jesus Christ. He had all those characteristics mentioned above and more. Matter fact, Jesus was looking for nice men when he was in search for his disciples. Jesus wasn’t searching for “perfect” men, but he was searching for nice men. Sometimes we feel the need to be perfect. Be nice and leave being perfect to Jesus. What if Jesus was only in search for perfect men when selecting his disciples? We wouldn’t have any disciples to read about, if that were the case. On the other hand, could you imagine Jesus selecting men that weren’t nice? Men with unpleasant, disagreeable, deceitful, apathetic, unkind, and uncooperative spirits. If the disciples portrayed these characteristics, what could these men teach us? And, would we listen? So, Jesus selected nice men, not perfect men. Jesus selected nice men with a heart to serve and help others in their time of need. Jesus selected men who were willing to listen and behave honorably in spite of harsh mistreatment. Jesus selected nice men. As for me, if you consider nice being last. I accept being last because I know who is first.